I facilitated a divergent thinking session last week. It was for a project team who were tracking well on the build of their prototype and had some pretty clearly defined success measures. From the outside looking in, they were going well. But the group felt they were being too safe in their solution design thinking, they wanted to stretch themselves beyond their comfort zone in the hope it would help them build a better product. I took on the role of facilitator with a little trepidation. Divergent thinking I love, blue sky thinking I’m all over, give me a blank piece of paper and I’ll fill it with crazy ideas and inappropriate doodles as quick as look at you. But diverging from an already established path is a very different task to ideating from the blank page. The challenging part for me is the balance between anchoring the thinking enough in the realities, constraints and success measures so that it is implementable, and the need to push out into the stratosphere to get something really emergent. On one side of the argument you need a good launch pad of reality, you can’t completely put the realities of the business aside because when it comes time to converge again you find that while ‘out there’ ideas may have been uncovered, they don’t correlate back to the actual viability and feasibility of what you’re trying to achieve. Conversely, I hear the argument that if you anchor too hard in the realities of the project you hamper the trajectory of the diverge and find when it comes back down to land it doesn’t land very far from where it started. The truth is, both can be true. You need the right amount of tension in both directions at the same time. I didn’t nail it in the session I ran last week. The team were happy with the outputs but I feel I could have pushed them further. While I was very cognisant of the need for a launch pad of reality, I don’t think I made it tangible enough for the participants. Then the trajectory of our ideation was a bit conservative and loose, we went in several different directions but nothing really made it to the moon in my opinion. I should have broken down the current state into smaller pieces. 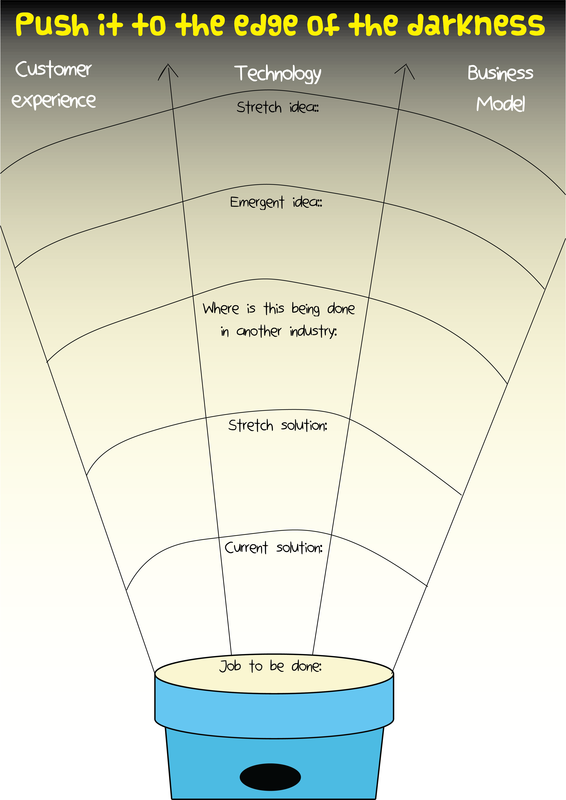 Ideating on a better way to achieve the whole thing is hard. If you only had to ideate on a component then that component could be small enough to pick up and hold in your hand. You could look at that smaller piece from a number of different angles, you could throw it around, stretch it, squeeze it out of shape a bit. You could achieve a real depth of understanding of that one small piece. It then also becomes simpler, and easier to understand the target for the divergent thinking to eventually converge back toward. This particular project had a Value Proposition Canvas for their product, a favourite thinking frame of mine. This means they had designed with a persona in mind and they spent time understanding the jobs this persona needed to get done and they had thought through the pains and gains of getting those jobs done. This would have been the perfect place to diverge from. The jobs to be done. With the beauty of hindsight I wish I had broken down the session into these jobs and had smaller groups work on various different ones. Then the diverging bit happens. With smaller groups starting to diverge on small, particular components, I think those nimbler teams could really get a sprint up. The cool aspect I think, is that each team could sprint in a different direction, but with clarity and a necessary level of detail. It would then be quite interesting to bring each of those sprints back together again with the opportunity to piece together something truly emergent. Start at the bottom in the illuminated, known space. Push further and further out out into the dark unknown. Then look at the current solution through the lenses of customer experience, technology and business model. You will maintain these 3 lenses throughout the rounds of ideation as they allow each area to be addressed individually while still keeping a sense of how it sticks together. For example, the solution might be a very simple customer experience that is achieved with new technology. Or it might be an existing technology paired with a brand new business model that shifts the customer experience. Then once they have their first idea, do some research – this is focused research specifically looking at the things you have on your page so far – my guess is that whatever wacky idea you come up with, someone is already doing something wackier that you can build from. Now for your second round of ideation, you have a baseline that is a stretch from where you started, you have some external stimulus, you are now ready for an emergent idea. This is the point where I would have each team present to and be critiqued by another team. The last round stretch idea is an opportunity to take on board the feedback you received in the critique and to push the idea a little further. I think framing in this way would break down the current solution sufficiently enough to make it manageable while also allowing for multiple divergent pushes. Rather than a big pile of half baked ideas, you would have fewer ideas but they would be well stretched. 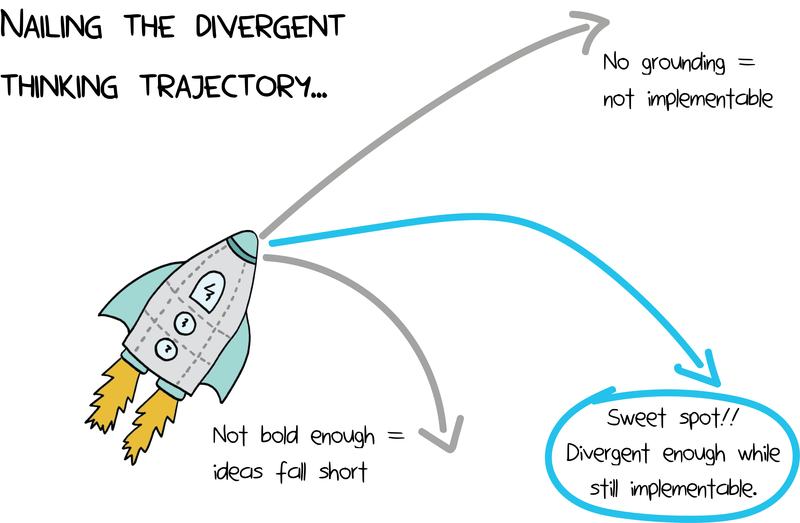 The other aspect I think is important to a successful divergent thinking session is to establish very clearly upfront that the goal of the session is not to converge and have a plan of attack – it is simply to come up with some wicked cool ideas – the converging part can come later. I’m really keen to give this new frame a go, who’s up for it?